Cindy here to share a shaker card for January’s Challenge Anything Goes. Arrange all the stamps from the Hero Arts You Are My Happy clear set to fit a 4 1/8 by 5 3/8 inch purple panel. Stamp and heat emboss in white. Die cut using the large heart die from the Hero Arts Stamp and Cut So Sorry set. Adhere acetate on back side of purple panel. Please foam tape all around. Trim white card stock slight smaller than purple panel. 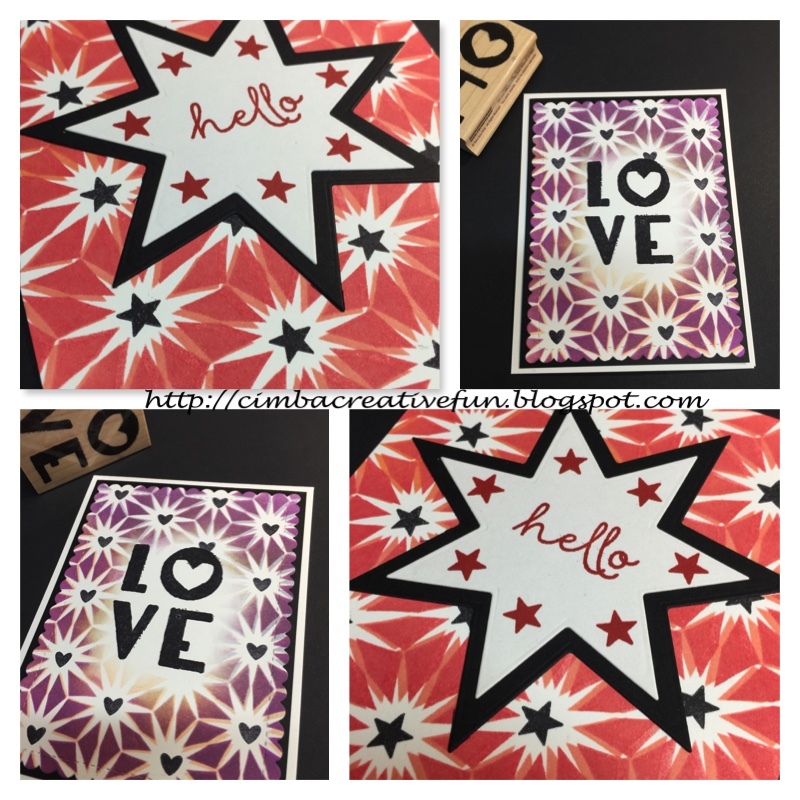 Use inking tool and sponge Spun Sugar over Hero Arts Delicate Petals Stencil onto it to create soft background. Place purple panel upside down, fill with sequins mix, peel off backing paper from foam tape; adhere stenciled panel pattern side down. Press to ensure all sides are sealed. Adhere shaker panel onto white card base. 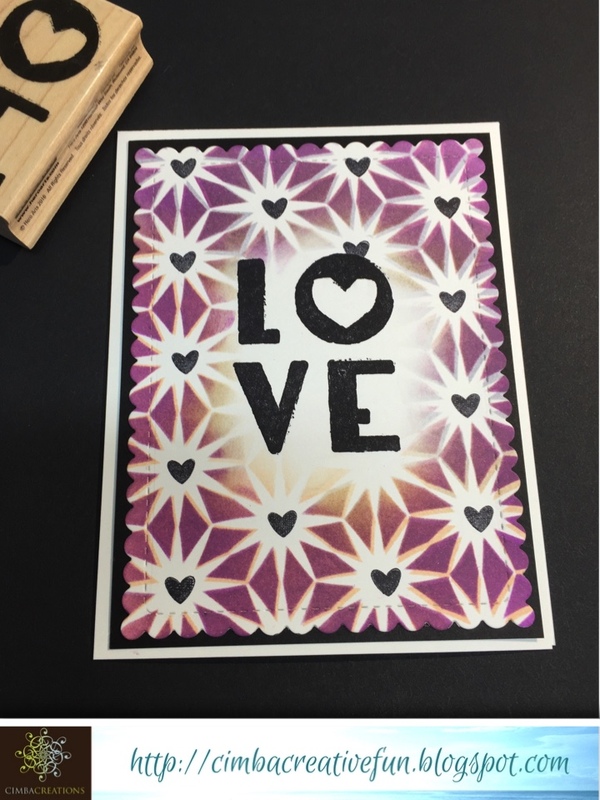 Die cut Love from the Hero Arts Stamp and Cut Love set using each purple card stock and pale mauve card stock. Glue pale mauve panel slightly offset onto the purple one. Adhere on top of card. You may not see all of the products I used in the a2z Scrapbooking Supplies store, but you could always make a Custom Order, just click the Request Custom Order on the left side bar. Use code Cindy15 to get 15% off any purchases $25 and more (shipping excluded) at check out. Categories: Embossing, Hero Arts, Valentine | Tags: a2z Scrapbooking, die cuts, Hearts, Hero Arts, Love, stencil | Permalink. Cindy here to share a non-card project. December’s challenge is Anything But a Card. So for today’s project I have decided to make something I’ve never made before, a Pocket-Letter. At first it seemed like a daunting task to ink up a full letter size sheet (to cut into 9 ATC size panels). But with the help of pretty designer paper, I proceeded with ease. I used Hero Arts Floral Heart Stamp and Cut by Lia. There are eight sentiments in the set and I stamped them all. Seven on the pocket panels and one on the Floral Heart die cut. Let’s take a look. Cut 9 ATC size (2.5 inch by 3.5 inch) panel from designer paper. Distress each with Vintage Photo. Die cut Spring Branch using Chocolate card stock. Brush the tips of some leaves with Silver Wink of Stella. Trimmed and adhere to left top and center top panels. Stamp “I Love You” and music note on top left panel. Trim flower from left over designer paper and adhere to top center panel. Stamp “Amore” on top right panel. Stamp “Valentine”, untitled postmark, and hearts on middle left panel. Stamp “Smitten” and strings of hearts on middle right panel. Stamp “True Love” on bottom left panel. Use Versamarker to trace over bird motif, heat emboss with clear powder on both center and right bottom panel. Stamp “You & Me” on center bottom panel. Stamp “Be Mine” on right bottom panel. Die cut Floral Heart using white card stock. Mask center and ink with Spun Sugar, slightly distress with Vintage Photo. Stamp sentiment in Vintage Photo and heat emboss with clear EP. Use the cutting die as guide, trace outline and fussy cut heart shape solid panel using Chocolate card stock. Adhere Floral Heart to solid heart shape panel. Use piercing tool to make small hole, attach jump ring to charm and to Floral Heart panel. Insert all the pieces into the pockets. Attach Floral Heart die cut at center of pocket letter. Attach rolled flower on top of heart. Trim thin strip of designer paper to fit the smaller opening at the left, insert and punch hole using the plastic sleeve as guide. Stamp and heat emboss “Sending Love” on matching designer paper, die cut using Hero Arts Stamp and Cut Yes, distress with Vintage Photo. Use the cutting die as guide, trace outline and fussy cut heart shape solid backing using pink CS. Distress. Glue stamped heart onto pink heart shape panel. Pierce small hole on small heart panel, thread with jump ring. Tie small heart to top hole with distressed ribbon. The Hero Arts Floral Heart Stamp and Cut by Lia set is really pretty right?! Imagine using it for Valentine, Mother’s Day, Wedding and Anniversary, and birhtday cards, it is quite versatile!! Get yours at the store today. Use code Cindy15 to get 15% off any purchases $25 and more (shipping excluded) at check out. Categories: Embossing, Flowers, Hero Arts | Tags: a2z Scrapbooking, die cuts, Hearts, Hero Arts, Letter, Love, pocket | Permalink. Hi friends, it’s Chark today with a little idea for gift bags for July 4th. I transformed heart die cuts from the Hero Arts So Sorry Stamp & Cut into flags to decorate bags you could fill with candy, sparklers, bang snaps, glow sticks or noisemakers. The secret to the quick transformation of the white hearts is to use Ink Daubers (on sale now for just $2!!). Just swipe on stripes and dab on the blue in the corner (or cover the whole mini heart). The ink daubers have a sponge applicator built in, so you just color with the bottle, no brushes needed. I added a little strip of rhinestones and celebrate ribbon I had in my stash. While the hearts dry, stamp the heart string on the bag with the fabulous Hero Arts Unicorn White ink. Adhere all the bits together and fill with your choice of fun stuff. These would be easy and fast for a wedding too. Just do a free-hand heart in the center of the die cut with the ink dauber in the wedding colors and add matching ribbon. You could even use white bags instead of the kraft lunch bags and ink the whole heart die cut in the wedding colors. Hope you have a fab weekend! 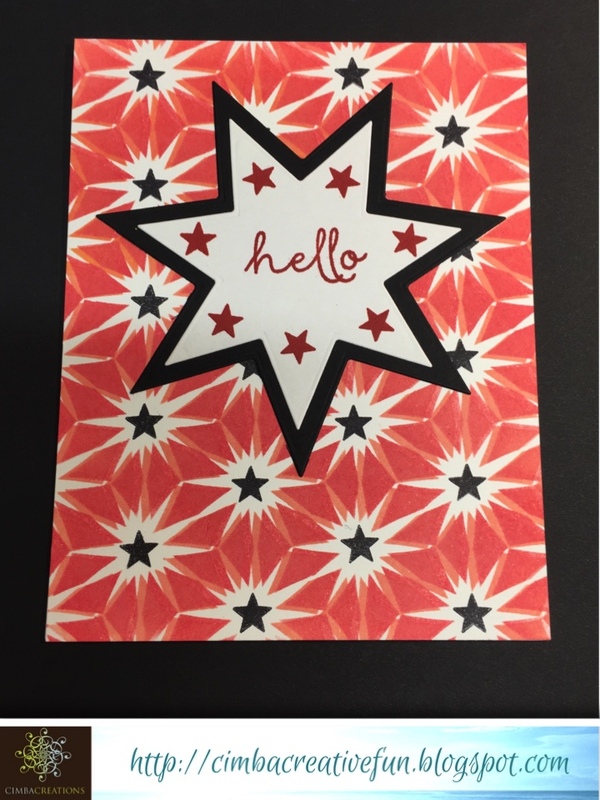 And that you’ll join in our July Challenge of Anything Goes—use a Hero Arts stamp, stencil, die or digi as your main element and then go crazy with the rest! You could win a $25 gift code to the a2z Scrapbooking store and I know you’d love that! HA Ink Daubers $2 right now! Categories: anything goes, Gifts & Gift Wrap, Handmade Cards, Hero Arts | Tags: 4th of July, chark, gift bags, Hearts, Hero Arts Unicorn ink, ink daubers, July 4th, kraft, so sorry, stamp & cut, stamping, unicorn ink, white ink | Permalink. Hello everyone!! Summer is in full swing! I can’t believe July is here already. Time is really moving fast. Our new challenge is “Anything Goes”!!!!! You can use any Hero Arts Die, Digi, Stamp, or Stencil on your project this month. This should be a very easy challenge!! You can create what you like! Nice right! Please be sure that your project contains at least ONE main HERO ART Product as the focal element! This will be fun and interesting. Hero Arts CL928 Party Time! Categories: anything goes | Tags: anything goes, balloons, dogs, Flowers, Hearts, stencils, Thanks | Permalink. Hi, crafty friends, it’s Chark here today to share two cards I created with the So Sorry Stamp & Cut set. I love this set, it has great sentiments and the heart dies are so versatile, I’ve used them with many cards, both Thinking of You and Birthday and Congrats. Both cards use panels of watercolor background and the large heart die in this set. The first card was my orderly sequin card, which meant I glued each sequin carefully down after sorting through for rows of matching colors. After I was finished with this card, I noticed that the blue die cut piece was laying on top of a jumble of sequins and I loved how it looked. So I gave it a shot for the next card. I like how it turned out but this is definitely a card that needs to be hand delivered, since it’s so bulky and I have no idea if these sequins would make it through the mail. So, how about you? Are you a lover of the neat and orderly or the chaotic sequins? Either way, I get my sparkle, so I’m happy! Hope you’ll join in the new June To Die For challenge for a chance to win $25 to the a2z Scrapbooking store, you can get some great stuff with that much money, especially if you take a look at our sale section. Categories: Handmade Cards, Hero Arts, Watercolor | Tags: chark, die cuts, die cutting, Hearts, sequins. so sorry stamp and cut, Watercolor | Permalink.